Or view larger version. Protestors in front of the Oakland Tribune buildling in Oakland Calfornia. September 4, 1964. Photographer unknown. Gelatin silver print. Collection of Oakland Museum of California. The Oakland Tribune Collection. Gift of ANG Newspapers. 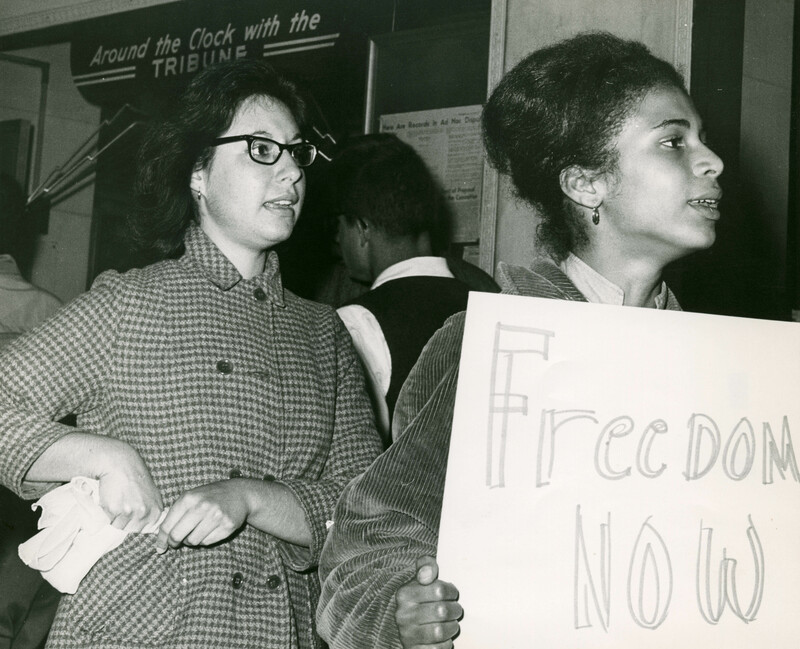 From 1964 to 1965 students from the University, California, Berkeley and members of local Bay Area African American organizations conducted a series of protests throughout Oakland, San Francisco, Berkeley, and Richmond demanding that local businesses hire more minority employees. Organized as the San Francisco Ad Hoc Committee To End Racial Discrimination, protestors used non-violent protest tactics learned from the Southern Civil Rights Movement. The Oakland Tribune was one of the targets of the Committee. Dozens of protestors marched in front of the Oakland Tribune building in downtown Oakland on September 4, 1964. The Ad Hoc Committee demanded that the number of minorities increase to 15-20% of the total number of employees at the newspaper. The conservative William F. Knowland owned the newspaper. He called the Committee's tactics illegal and refused to give into their demands. This was one of the first defeats for the Bay Area Civil Rights movement, who had previously won concessions from other local businesses. .